The company plans to 'drop everything' to fix its burger emoji - but why? 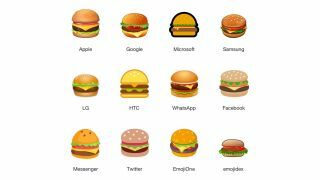 A Tweet about the design of Google's burger emoji has sparked an intense online discussion about how the foodstuff should look, and prompted Google CEO Sundar Pichai to say he would 'drop everything' to fix it. Seriously. If you've ever doubted the power of social media, the recent development surrounding Google's burger emoji (that's a phrase we never thought we'd have to type) will show you how impactful it can be. Following a viral Tweet from author and media analyst Thomas Baekdal, which complained about the placement of the cheese in Google's burger emoji, the CEO of the world's leading technology company has vowed to put the emoji's design above everything else. If that's not power we don't know what is. The Tweet might appear pretty innocent on the surface. After all, have you ever seen a burger that places the cheese underneath the meat? Of course not. That would be madness. Such a burger could only exist in a world gone topsy-turvy. Yet, inexplicably, there it is. This burger bizarreness could explain why, at the time of writing, the Tweet has gained nearly 40,000 retweets and nearly 2,000 comments. Clearly this is an important issue that a lot of people feel strongly about. And because people who are interested in emojis appear to be anything if not thorough, the full list of burger emojis has been dredged up from emojipedia like a political scandal for us all to gawp at and contemplate. How did we, as society, let this happen? This isn't the only emoji to be publicly shamed, though. Google's pint of beer emoji has been dragged through the mud like an accessory to murder thanks to its gravity-defying head of foam, which appears to hover above the alcoholic good stuff like a tipsy cloud. Perhaps they need a new illustrator, some icon design tips, or at least some decent reference images. There's no word yet on whether or not Google has fixed the placement of cheese on its burger emoji. But with the top technological minds in the world working on it, surely it won't take long to fix?